When Sonic arrives in the next town he discovers it is also being terrorized by Badniks, but they are not the only one’s trying to get Sonic! His greatest admirer and sometimes stalker, Amy Rose wants him to join back up with the Resistance as well! How will Sonic react to her pleas? On his way to the next town, Sonic encounters a Death Crab. He acknowledges that it gave him a good race but nevertheless cannot let it destroy the nearby town. As the giant robot approaches the edge of town, Sonic fells the Super Badnik with a series of homing spins causing the behemoth to collapse just at the outskirts of town. Sonic lands with a triumphant “TA DA!” to the praise and adoration of the townsfolk. Their jubilation suddenly changes to terror as the Death Crab once again begins to stir behind Sonic. They try to warn Sonic that the Death Crab is not yet out for the count, but before he can react Amy Rose arrives with a devastating downward smash from her Piko Piko Hammer that turns the Badnik’s head into a crater leaving Sonic to look back with a shocked expression. Amy teasingly accuses Sonic of getting sloppy, ignoring the wisecrack, Sonic ironically expresses surprise at Amy arrival. Amy divulges that she heard about what Sonic did in the nearby town and just knew that he would head this way. Skeptically, Sonic surmises that word travels fast, quickly dismissing the thought, he turns and prepares to depart, noting that things seem under control and thanking Amy for the save in a rather dispassionate manner. Amy calls after Sonic to wait, emphasizing that she traveled to the town in order to seek him out specifically. Sonic snidely retorts that Amy chasing him down is sort of her thing. Exasperated, Amy tries to explain that she is not there merely to stalk him, but that there is other important business at hand, whilst still confessing that she does always enjoy being around Sonic. She asks Sonic to rejoin the Resistance, but Sonic is confused by this request, thinking that since the war was won, and all that remained was clean up and reconstruction. Amy explains that they had underestimated the extent of the Eggman Empire‘s reach, and that they need his help stopping the multitudes of remaining Badnik forces. Ultimately, she claims that if the Resistance is to finish the fight, they need to work from a strong centralized position and that she needs Sonic’s help to achieve that. Sonic takes a hard pass on the proposition, and Amy disappointingly questions why he will not help. Sonic explains how Tails had discerned that someone else is commanding the Badnik forces and that a Super Badnik showing up where him and Amy were was no coincidence. Amy admits that she had not thought of that and leverages it as another reason for Sonic to come back and join the Resistance. Sonic disagrees and persists that it is all the more reason for him to continue on investigating exactly what is going on. Amy argues that it would be inefficient to travel around from town to town for weeks or months but Sonic is adamant that it would be worth helping those people in need. Suddenly, one of the townsfolk runs up to them in a panic, warning them that they are under attack. Sonic reassures her that they already took care of the Super Badnik, but she clarifies that another army of Badniks is advancing from the west. Sonic concludes that the Death Crab was a decoy and Amy resolves that they must stop the invasion before the city is overrun. Sonic runs ahead while Amy organizes the townsfolk who inform her they are using the town hall as a make-shift bunker. Sonic encounters a group of Egg Walkers which engage with him by launching a wave of tracking missiles. Sonic evades the attacks and easily dispatches the Badniks. Meanwhile, Amy help direct the citizens to safety and organizes those able to fight in defense. She instructs the armed citizens to take position on the upper floors of the nearby buildings and hold their fire until the Badniks invade the town square. Sonic is caught off guard by an Egg Pawn who fires a machine gun at him, but is able to evade and reposition himself safely, noting that he has let too many slip by him. A villager declares to Amy that not everyone is accounted for, and she commands her to pair up and go door to door, bringing back no more than 10 at a time. She also warns them to keep low and check their corners for enemies before alerting the villagers that the enemies are approaching. As the Badniks enter the square, Amy gives the order to open fire and the townsfolk wipe out the enemy robots with their Wispons. Signalling that the first wave down, Sonic, Amy, and the villagers look on confidently at the scrapped Badniks. Witnessing Amy’s effective strategy, Sonic offhandedly comments that he thought Knuckles was the leader of the Resistance. Amy smugly agrees, but asserts that she was the one who organized everything. Sonic recognizes and affirms this, asking what the plan is going forward. Amy assesses that the town hall is a good defensible position, but the sheer number of enemies will overrun it in time. Together Amy and Sonic conclude that they must thin the enemy’s numbers to give the villagers a fighting chance. The pair takes off, Sonic towing Amy at high speeds as she begins smashing Badniks with her Piko Piko Hammer. Sonic slings Amy into the air as she spins her hammer taking out multiple Egg Pawns before Sonic catches her in his arms, much to her delight. Sonic and Amy race around the battle field destroying Badniks. Amy asks Sonic rhetorically, “Isn’t this fun?” to which Sonic emphatically replies “OH YEAH!” Having dispatched all the nearby Badniks, Amy sweetly reminds Sonic that if he rejoined the Resistance that he could do this sort of thing all the time. Sonic immediately turns his back on her and says “Nope.”, much to Amy’s frustration. The pair continue fighting Badniks as Sonic reiterates that he already told her what his plan was, and Amy attempts to guilt him since he did not even consider coming back. Sonic dismissively replies that he does not need to as he races up the side of a building with a super peel out and jumps off, smashing the enemies below before. Flicking a scattered bolt off himself, Sonic states that he knows what works best for him. Amy asks if he has considered what is best for everyone else as she mashes an Egg Pawn over the head with her hammer. Sonic tells Amy that he is not good at figuring things like that out and that they should both stick to their strengths before casually warning her of an Egg Walker behind her. Amy smashes the Badnik into a wall and makes a personal plea, asking Sonic to do it for her if he will not do it for the Resistance. Once again he denies her, unwilling to play favorites. She then changes tact, pleading with him to do it for his friends then, alerting him to Egg Pawns closing in on him in an equally casual manner. Sonic darts off to take them out, assuring Amy that their friends do not need him if they have her. Finally, Amy appeals to him one last time with the reward of chili dogs. Sonic seems persuaded by this deal which is met by Amy’s incredulous reply. However Sonic is distracted when he spots an enemy Blowfish Transporter drop ship still deploying additional Egg Pawns. They surmise that they could not get through such a large number of Badniks conventionally; so instead, they use the “croquette bomber” technique. Sonic performs a spin dash in place and Amy smacks him with her Piko Piko Hammer like a croquette mallet, sending him flying over the horde into the Blowfish, destroying it and the surrounding troops. As the smoke clears, Sonic is seen sitting amongst the wreckage. Amy rushes over to him and inquires if he is OK. Sonic laughs joyously praising her for launching him right into the transporter’s weak spot, the power cell. Reluctantly, Amy recognizes that is the last of the enemy forces, and Sonic will likely be moving on to the next town. In debonaire fashion, Sonic agrees declaring that is just his way, helping people and going from place to place as free as the wind. Amy is visibly smitten by Sonic, but shakes it off, accepting Sonic for who he is and acknowledging that she would not want to change him because it is why she loves him. Bashful and surprised by Amy’s response, Sonic offers Amy the opportunity to join him, but she declines citing the Resistance’s need for her. However, she does tip him off that Knuckles is in a nearby town and might need some assistance as well. Sonic teases her with a sarcastic military salute, addressing her as commander. Amy threatens to slap him as they affably part ways. Meanwhile, the same mysterious figure is shown to once again watching events unfold. This time Dr. Eggman’s old henchmen Orbot and Cubot are seen with the individual. The unknown figure in the command chair notes that the operation was yet another failure because they did not account for how much Amy Rose had grown. Additionally, they express frustration that now Sonic is deviating from the planned path, but Orbot notes that he is headed for Rough and Tumble. Their new boss concludes with the hopeful sentiment that they will finish off Sonic for them. Next Time; KNOCK KNOCK, It’s Knuckles! In issue #2 Flynn once again delivers a perfect balance of action and character development. While one might think that Sonic continuing his tour around the hinterlands of his world and once again saving the a small town from the encroaching Badnik hordes is already getting a bit repetitive, I would have to disagree. Sure the setting is similar, but the content is all different. Beyond a different set of encroaching Badniks, it is clear that these first four books are all about the characters and their relationships to the blue blur, himself. 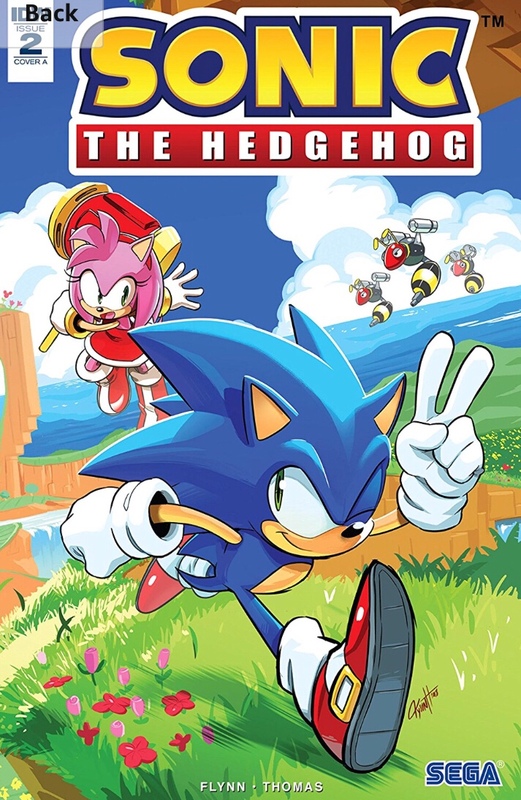 While there is not much in the way of plot development in this issue, though it was on par with the first, it was not as impactful because of the fact that it was the foundational issue, the story is all about establishing Amy Rose as a character, who she is, what she can do, and what her relationship with Sonic is. And let us be upfront, that is the question on everyone’s minds going into this issue. Once again, Flynn and Thomas deliver a nuanced depiction of the two hedgehogs, which in my reading seems to almost outshine the action sequences. The pairs casual dialogue as they dispatch legions of enemies with ease really keeps the spot light on the couple’s complex subtext. Despite the straightforward plot, seeing the characters interact with each other and the townsfolk was a joy to read. Like I said about issue #1, it is clear that this team knows Sonic, and I have no doubt that heading into May we will have a strong foundation for these characters and the situations they are bound to get into. The references to Sonic Forces are much more overt in this issue than the last. Amy outright asks him to rejoin the Resistance, Knuckles is identified as the commander, and she acknowledges that she is the strategist and intelligence organizer as she appeared to be in the game. As previously iterated, the characters are the issue. We were promised an Amy Rose like we have never seen before, and I believe we got one. Historically, Amy Rose’s chief and ruling characteristic was her love for Sonic. She was his biggest fan and in different iterations this manifested in various forms ranging from admiration to fangirling to full fledged stalking. However, SEGA has expressed that they wish to get away from the latter and Flynn has taken up the task to further that goal. At her core, Amy is still madly in love with Sonic, even by her own confession in this issue. Yet while she is more than that, she is not less. Flynn expands on her support role shown in Forces and portrays her as a capable fighter, wielding her magical Piko Piko Hammer on par with Sonic’s combat ability. Not only that, but she is shown to be a brilliant strategist, expertly organizing the townsfolk into an effective defense. She seems to be able to switch between commanding tactician and flirtatious sweetheart (at least where Sonic is concerned) seamlessly. This is displayed in their flirtatious “will they, won’t they” banter as they casually dispatch Badniks. But perhaps the most defining moment for Amy was Sonic’s final declaration after all of her pleas to join the Resistance. Sonic declares that he needs to be free to do things his own way. Recognizing him as cool and suave as ever, Amy swoons over him, obviously infatuated, but recognizes the need to let him be who he is despite her own desires. This marks a growth in her that we have not seen in any previous iteration and shows a much more mature Amy than we have seen to date. Sonic’s response to Amy through out the issue are interesting, to say the least. Sonic is highly repelled, skeptical, and dismissive of her throughout much of the book. Initially, he barely acknowledges her, doing whatever he can to dismiss her and her feelings. It is clear he suspects she is once again stalking him and does not want to reward bad behavior or have to deal with her obsessive tendencies. However, when it came down to action, we see Sonic is much more open to her, happy to cooperate to help save the townsfolk and fight off the Badniks. He is notably impressed by her work organizing the townsfolk, and visibly enjoyed fighting the Badniks together. Ultimately, we see Sonic lower his defenses and show real appreciation for Amy when he sees how she has matured, even bashfully offering for her to join him. Like Tails, the fact that she declines the offer to be with the one she loves only reinforces that she truly has matured. We are once again teased with the unknown individual inhabiting the Eggman Empire command chair. This time we see Eggman’s usually lackeys, Orbot and Cubot with them. This accentuates that whoever is in that chair is now truly in command of Eggman’s forces. Who it is remains a mystery. One theory going around was that it is Metal Sonic, but the digital looking dialogue text used for Cubot implies that it is not a robotic or cyborg individual. Perhaps it is Infinite or some other more obscure villain from Sonic’s past? I have a feeling we will not find out for sure at least until issue #4! Ian Flynn and Adam Bryce Thomas team up once again for the first time since the Sonic Forces digital comic to bring us issue #2. Not only did ABT do the art for this book, but also the inks and and coloring as well. Together this contributes to his super clean art style, that makes him perhaps my favorite Sonic artist currently working on the book. Thomas deviates from the simplistic Forces avatar body types, creating a few new characters that stood out with fans, the new lamb villager, Lanolin, in particular. The action scenes feel fast and frenetic, but what stands out is his ability to portray such a wide array of expressions. Amy and Sonic make so many different faces in this issue, that you could almost discern what they were communicating to each other through expressions alone. Perhaps the scene that stuck in my mind the most were the proud and courageous expressions of the townsfolk after making Swiss cheese out of the invading Badniks. ABT’s coloring also lends the book a bit more of a darker tone than that of Yardley, despite the colorful and somewhat silly enemies they face. They sky is a constant grey as twilight sets in and the sun sinks beyond the horizon. Overall, I may be slightly bias, but I hope we see much more from Thomas in the future! Thankfully, Issue #2 has far fewer variants than issue #1! 66% less, at least, in fact! But quality over quantity, as they say, and these covers have plenty. Cover A by Tyson Hesse: Part 2 of 4 of Hesse’s connecting covers, the full image you might have seen at the top of the page! You may have noted that Sonic is flashing the “peace sign”, but it is actually an Easter egg! On each of Hesse’s first 4 covers, Sonic is holding up fingers equal to the issue number, similar to what he does in some of the game art and title screens. Cover B by Adam Bryce Thomas: Continuing the formula of the interior artist illustrating the B Cover, ABT makes his IDW debut. RI-A by Nathalie Fourdraine: Nathalie’s 2nd of 7 confirmed RI-A covers in her signature lineless style. This will be a 1:10 incentive cover, as the rest of hers will be. RI-B by Jonathan Gray with Colors by Matt Herms: Jon Gray and Matt Herms team up for the 1:25 incentive cover featuring a nod to Sonic CD where Amy the Rascal was first introduced. While, I thought the first issue was great, and it was genuinely great to see the growth of Tails and his return to competency, Amy needed it more. Her character has been handled in so many different ways over the years that is was refreshing to see her mature. If this trend continues, we may see a somewhat more sophisticated and emotionally stable Sonic and friends from Flynn and IDW. While the story is pointedly lacking, the character establishment more than makes up for it, and I am still genuinely curious who the new villain may be. Add in ABT’s excellent art work and you have the makings of my favorite IDW Sonic comic yet! Likely until next week that is when Sonic’s friendly nemesis, Knuckles returns! I hope you enjoyed my review of issue #2! My apologies it was so late! I had a slight accident that has made it slightly difficult to type! Keep an eye out for a transcript of the latest BumbleKast that came out today and a preview of issue #3 that is doubtless on the horizon! Previous Issue #4 Cover Completes the Image! Next Sonic #3 & Knuckles Preview! Loved the art, it was stylish and dynamic too!